I’ve been told that I have a tendency to see things that others don’t. It’s a gift I don’t even pretend to understand. With the turf being redone, the field near my house quickly transitioned from dirt to mud to lake as three inches of rain fell in under an hour. The skies cleared. The water began to drain off. Then as the sun started to set, amazingly clear reflections appeared in puddles all over the field. Sometimes once you see something, no matter how hard you try, you can’t unsee it. I know. I’ve been trying, with no success, to get the image of God and I and our intense tete-a-tete out of my head. Wasn’t it a blessing? A breakthrough? A revelation? Yes, yes and yes. But it didn’t just open a door. It knocked down the whole wall. I can’t put it back up. It’s not that I necessarily want to put it back up, but it’s left me feeling pretty exposed even now, three weeks later. It’s been long enough now for the old insecurities to start creeping back in. I still find myself flinging stuff at God sitting over there in his chair but now when I do, I can’t help but see myself from his side of the room. Yes my flaws and imperfections are still there but now I can’t help but see it with a different lens of compassion. Compassion is something reserved for other people, not for myself. It’s uncomfortable in a way that I can’t quite put my finger on. 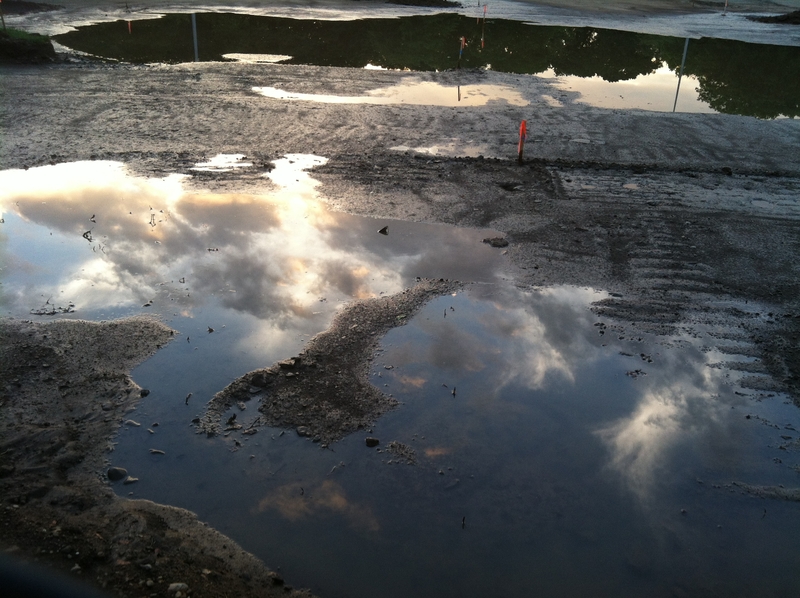 But I keep looking at this photo of the mud puddles reflecting the sunset so beautifully. It’s not a flawlessly perfect mirror reflection but it’s strikingly beautiful nonetheless. One expects to see such reflections in pristine mountain lakes not in a stripped-down muddy football field full of contractor’s stakes and heavy equipment. So if beauty lies in the unexpected, then it’s not such a far leap to find consolation in the uncomfortable. It’s just a matter of perspective. This entry was tagged blessing, compassion, door, God's chair, reflections, revelation, wall. Bookmark the permalink.